MINNEAPOLIS -- More than 50 people were arrested during the second day of protests in Minneapolis over the shooting of a black man by a police officer during an apparent struggle. 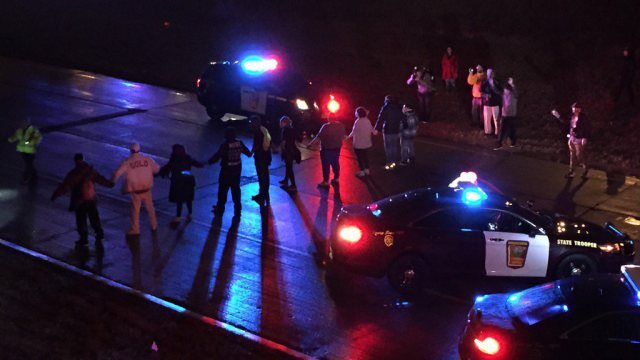 Hundreds of people protesting 24-year-old Jamar Clark's shooting blocked Interstate 94 on Monday night, shutting down the northbound lanes for about two and a half hours. Minnesota State Patrol Lt. Tiffani Schweigart said 43 adults and 8 juveniles who refused multiple orders to disperse were arrested. Authorities have released few details about the shooting, which has angered some community members after witnesses said the man was handcuffed when he was shot. Police said their initial information showed the man, a suspect in an assault, was not handcuffed. He was taken to a hospital after the shooting, but his family said Monday night he had died after being taken off life support. The demonstrations came after the mayor of Minneapolis earlier in the day asked for a federal civil rights investigation into the shooting. Mayor Betsy Hodges said she wrote to the Civil Rights Division of the Department of Justice and to the U.S. attorney for Minnesota seeking the investigation in the "interest of transparency and community confidence." The state's Bureau of Criminal Apprehension is already conducting a criminal investigation, but Hodges said the city needs "all the tools we have available to us." The incident sparked protests Sunday and an overnight encampment at the north Minneapolis police precinct near the site of the shooting. Protesters on Monday applauded the request for a federal investigation but said they would continue the precinct sit-in until authorities release any video they have of the incident as well as the officer's identity. At least eight tents were set up outside Monday, and a handful of protesters were sitting behind glass doors in the foyer, including one who was knitting. "We're still not moving until we get that footage," said Michael McDowell, a member of Black Lives Matter. Later, the crowd of hundreds blocked I-94. CBS affiliate WCCO in Minneapolis said police ordered protesters to disperse from the highway at 8 p.m. local time, and began arresting those who refused to move half an hour later. Police told WCCO the 43 adults and 8 juveniles arrested would face charges of "pedestrian on freeway" and "unlawful assembly." Schweigart said those arrested were cooperative and no use of force was required in detaining them. Authorities have not released the man's name, but family members have identified him. Clark's father, James Hill, told The Associated Press that his son suffered a single gunshot wound over his left eye. Ramona Dohman, the commissioner of the Minnesota Department of Public Safety, said the officers' identities would be released after investigators interview them. She declined to say how long the investigation could take. Harteau, the police chief, said she welcomed a federal investigation. "Everyone involved needs and deserves the truth and the facts," she said.